How about a little decoding fun? One of the first tasks you’ll tackle when setting up your YNAB budget is setting up your Accounts. The first couple of Accounts everyone enters are usually very basic and relatively self-explanatory: checking, savings, credit cards, cash. We’re all familiar with these types of accounts and matching our physical accounts with YNAB’s account types is fairly straightforward. But what happens when we have an account that isn’t so straightforward? What if we want to think outside the box a little or bend best practices to better fit our own personal circumstances? For those of you who, like me, are unapologetic boundary-pushers, I’m here to help you decode the logic/programming behind YNAB’s dropdown box. First step: let’s deconstruct exactly what is happening in these last three fields. 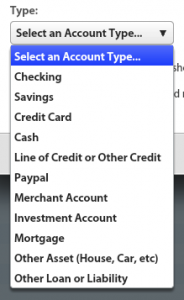 Account Type is a dropdown list of 11 account type options. Shhh, don’t tell YNAB that I told you but these are really just placeholders. They are a beautiful example of putting if-then computer logic into plain language for an enhanced User Experience. So, that’s all nice and geek-y but, I get it, you want practical. You want to know, “what type of account is this? !” (this being whatever funky account it is you’re trying to create in YNAB). Patience, patience. Time for the second step. 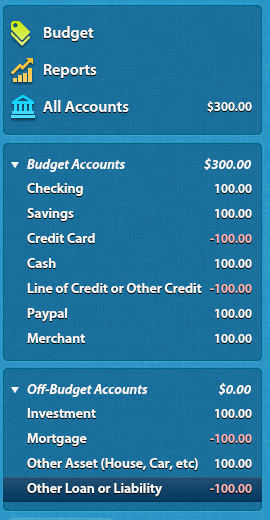 Recalling the first screenshot above, YNAB gives us 11 different account type options. Since there are really only 4 possibilities some of YNAB’s example accounts are duplicates; different names for exactly the same results. Using our chart above, we can look at YNAB’s eleven account types and define whether they are a type 1, 2, 3, or 4. So what’s all this mean and how are you supposed to use this information? Does this account have a positive or a negative starting balance? Once you know On or Off, positive or negative, you can choose any account type in the corresponding box. Yes, that’s right, I said any. If you’re really a rebel, you could choose “cash” and go on to create a checking account. Or you could choose “Investment Account” and go on to add your fully restored 1965 Ford Mustang because you want it to be counted toward your total net worth. In the end, the name you choose from the dropdown box does nothing more than tell the program, “get ready, boys, here comes a positive balance” and then selects the on- or off-budget radio button for you. If you really want to nitpick and boil it down, all you really have to do is pick any account with the right type of account balance — negative or positive. 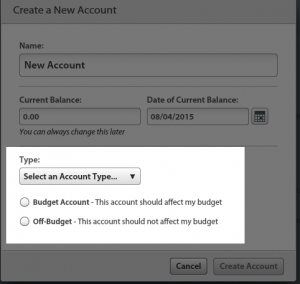 YNAB will suggest that the account be on- or off-budget but you have the option to override the program’s suggestion and click on the other radio button. So you could choose Checking, enter your starting balance, and override the on-budget suggestion by clicking on off-budget instead and you’d end up with an Investment or Other Asset account. 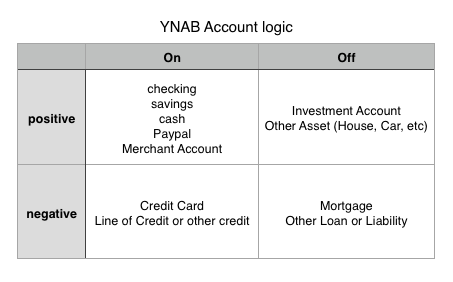 On the right is one final visual demonstrating the decoded logic of YNAB’s account types. I’ve created 11 different accounts. Each account name corresponds to the type of account I chose from the dropdown box. I gave each account a $100 starting balance and let YNAB decide whether that balance should be positive or negative. I also let YNAB choose whether the account would be on- or off-budget.